This article is about the municipality in India. For its namesake district, see Mysuru district. For other uses, see Mysore (disambiguation). Mysore ( i/maɪˈsʊər/), officially renamed as Mysuru, is the third most populous city in the state of Karnataka, India. Located at the base of the Chamundi Hills about 146 km (91 mi) southwest of the state capital Bangalore, it is spread across an area of 128.42 km2 (50 sq mi). According to the provisional results of the 2011 national census of India, the population is 887,446. Mysore City Corporation is responsible for the civic administration of the city, which is also the headquarters of the Mysore district and the Mysore division. Mysore served as the capital city of Kingdom of Mysore for nearly six centuries, from 1399 until 1974. The Kingdom was ruled by the Wodeyar dynasty, except for a brief period in the late 18th century when Hyder Ali and Tipu Sultan were in power. Patrons of art and culture, the Wodeyars contributed significantly to the cultural growth of the city. The cultural ambience and achievements of Mysore earned it the sobriquet Cultural capital of Karnataka. Mysore is noted for its palaces, including the Mysore Palace, and for the festivities that take place during the Dasara festival when the city receives a large number of tourists. It lends its name to the Mysore style of painting, the sweet dish Mysore Pak, the Mysore Peta (a traditional silk turban) and the garment known as the Mysore silk saree. Tourism is the major industry, while information technology has emerged as a major employer alongside the traditional industries. Mysore depends on rail and bus transport for inter-city connections. The city was the location of the first private radio station in India. Mysore houses Mysore University, which has produced several notable authors, particularly in the field of Kannada literature. Cricket is the most popular sport in the city. The name Mysore is an anglicised version of Mahishūru, which means the abode of Mahisha in the local Kannada language. Though in Sanskrit Mahisha means buffalo, here Mahisha refers to Mahishasura, a mythological demon who could assume the form of both human and buffalo. According to Hindu mythology, the area was ruled by the demon Mahishasura. The demon was killed by the Goddess Chamundeshwari, whose temple is situated atop the Chamundi Hills. Mahishūru later became Mahisūru (a name which, even now, the royal family uses) and finally came to be called Maisūru, its present name in the Kannada language. In December 2005, the Government of Karnataka announced its intention to change the English name of the city to Mysuru. This was approved by the Government of India, but as of 2011 the formalities necessary to incorporate the name change were yet to be completed. The central government approved this request in October 2014 and Mysore was renamed (along with other 12 cities) to "Mysuru" on November 1, 2014. The site where Mysore Palace now stands was occupied by a village named Puragere at the beginning of the 16th century. :281 The Mahishūru Fort was constructed in 1524 by Chamaraja Wodeyar III (1513–1553),:257 who passed on the dominion of Puragere to his son Chamaraja Wodeyar IV (1572–1576). Since the 16th century, the name of Mahishūru has commonly been used to denote the city. :31 The Mysore Kingdom, governed by the Wodeyar family, initially served as a vassal state of the Vijayanagara Empire. With the decline of the Vijayanagara Empire after the Battle of Talikota in 1565, the Mysore Kingdom gradually achieved independence, and by the time of King Narasaraja Wodeyar (1637) it had become a sovereign state. :228 Seringapatam (modern-day Srirangapatna), near Mysore, was the capital of the kingdom from 1610.:257 The 17th century saw a steady expansion of its territory and, under Narasaraja Wodeyar I and Chikka Devaraja Wodeyar, the kingdom annexed large expanses of what is now southern Karnataka and parts of Tamil Nadu, to become a powerful state in the southern Deccan. The kingdom reached the height of its military power and dominion in the latter half of the 18th century under the de facto rulers Hyder Ali and his son Tipu Sultan. The latter demolished parts of Mysore to remove legacies of the Wodeyar dynasty. :257 During this time, Mysore kingdom came into conflict with the Marathas, the British and the Nizam of Golconda, leading to the four Anglo-Mysore wars, success in the first two of which was followed by defeat in the third and fourth. After Tipu Sultan's death in the Fourth Anglo-Mysore War in 1799, the capital of the kingdom was moved back to Mysore from Seringapatam,:249 and the kingdom was distributed by the British to their allies of the Fourth Mysore war. The landlocked interior of the previous Mysore Kingdom was turned into a princely state under the suzerainty of the British Crown. The former Wodeyar rulers were reinstated as puppet monarchs, now styled Maharajas. The British administration was assisted locally by Diwan (chief minister) Purnaiah. Purnaiah is credited with improving Mysore's public works. :249 Mysore lost its status as the administrative centre of the kingdom in 1831, when the British commissioner moved the capital to Bangalore. :251 It regained that status in 1881:254 and remained the capital of the Princely State of Mysore within the British Indian Empire until India became independent in 1947. The Mysore municipality was established in 1888 and the city was divided into eight wards. :283 In 1897 an outbreak of bubonic plague killed nearly half of the population of the city. With the establishment of the City Improvement Trust Board (CITB) in 1903, Mysore became one of the first cities in Asia to undertake planned development of the city. Public demonstrations and meetings were held there during the Quit India movement and other phases of the Indian independence movement. After Indian independence, Mysore city remained as part of the Mysore State, now known as Karnataka. Jayachamarajendra Wodeyar, then king of Mysore, was allowed to retain his titles and was nominated as the Rajapramukh (appointed governor) of the state. He died in September 1974 and was cremated in Mysore city. 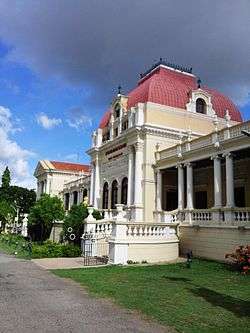 Over the years, Mysore became well known as a centre for tourism; the city remained largely peaceful, except for occasional riots related to the Kaveri river water dispute. Among the events that took place in Mysore and made national headlines were a fire at a television studio that claimed 62 lives in 1989, and the sudden deaths of many animals at the Mysore Zoo. Mysore is located at 12°18′N 74°39′E﻿ / ﻿12.30°N 74.65°E﻿ / 12.30; 74.65 and has an average altitude of 770 metres (2,526 ft). 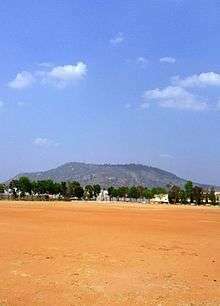 It is spread across an area of 128.42 km2 (50 sq mi):4 at the base of the Chamundi Hills in the southern region of Karnataka. Mysore is the southern-most city of Karnataka, and is a neighbouring city of the states of Kerala and Tamil Nadu in the south, flanked by the state cities Mercara, Chamarajanagara, and Mandya. People in and around Mysore extensively use Kannada as medium of language. Mysore has several lakes, such as the Kukkarahalli, the Karanji, and the Lingambudhi lakes. In 2001, total land area usage in Mysore city was 39.9% residential, 16.1% roads, 13.74% parks and open spaces, 13.48% industrial, 8.96% public property, 3.02% commercial, 2.27% agriculture and 2.02 water. :35 The city is located between two rivers: the Kaveri River that flows through the north of the city and the Kabini River, a tributary of the Kaveri, that lies to the south. Mysore has a tropical savanna climate designated Aw under the Köppen climate classification. The main seasons are summer from March to June, the monsoon season from July to November and winter from December to February. The highest temperature recorded in Mysore was 39.4 °C (103 °F) on 4 April 1914, and the lowest was 7.7 °C (46 °F) on 16 January 2012. The city's average annual rainfall is 804.2 mm (31.7 in). The civic administration of the city is managed by the Mysore City Corporation, which was established as a municipality in 1888 and converted into a corporation in 1977. Overseeing engineering works, health, sanitation, water supply, administration and taxation, the corporation is headed by a mayor, who is assisted by commissioners and council members. :43 The city is divided into 65 wards and the council members (also known as corporators) are elected by the citizens of Mysore every five years. The council members in turn elect the mayor. The annual budget of the Corporation for the year 2011–2012 was ₹426.96 crore (US$63.45 million). Among 63 cities covered under the Jawaharlal Nehru National Urban Renewal Mission, Mysore City Corporation was adjudged the second best city municipal corporation and was given the "Nagara Ratna" award in 2011. Urban growth and expansion is managed by the Mysore Urban Development Authority (MUDA), which is headed by a commissioner. Its activities include developing new layouts and roads, town planning and land acquisition. One of the major projects undertaken by MUDA is the creation of an Outer Ring Road to ease traffic congestion. Citizens of Mysore have criticised MUDA for its inability to prevent land mafias and ensure lawful distribution of housing lands among city residents. The Chamundeshwari Electricity Supply Corporation is responsible for electric supply to the city. Drinking water for Mysore is sourced from the Kaveri and Kabini rivers. :53 The city got its first piped water supply when the Belagola project was commissioned in 1896. As of 2011, Mysore gets 42.5 million gallons water per day. Mysore sometimes faces water crises, mainly during the summer months (March–June) and in years of low rainfall. The city has had an underground drainage system since 1904. The entire sewage from the city drains into four valleys: Kesare, Malalavadi, Dalavai and Belavatha. :56 In an exercise carried out by the Urban Development Ministry under the national urban sanitation policy, Mysore was rated the second cleanest city in India in 2010 and the cleanest in Karnataka. The citizens of Mysore elect four representatives to the Legislative assembly of Karnataka through the constituencies of Chamaraja, Krishnaraja, Narasimharaja and Chamundeshwari. Mysore city, being part of the larger Mysore Lok Sabha constituency, also elects one member to the Lok Sabha, the lower house of the Indian Parliament. The politics in the city is dominated by three political parties: the Indian National Congress (INC), the Bharatiya Janata Party (BJP), and the Janata Dal (Secular) (JDS). According to the provisional results of the 2011 census of India, Mysore had a population of 887,446, consisting of 443,813 males and 443,633 females, making it the third most populous city in Karnataka. The gender ratio of the city is 1000 females to every 1000 males and the population density is 6,910.5 per square kilometre (17,898/sq mi). According to the census of 2001, 73.65% of the population are Hindus, 21.92% are Muslims, 2.8% are Christians, and the remainder belong to other religions. The population exceeded 100,000 in the census of 1931 and grew by 20.5 per cent in the decade 1991–2001. As of 2011, the literacy rate of the city is 86.84 per cent, which is higher than the state's average of 75.6 per cent. Kannada is the most widely spoken language in the city. Approximately 19% of the population live below the poverty line, and 9% live in slums. According to the 2001 census, 35.75% of the population in the urban areas of Karnataka are workers, but only 33.3% of the population of Mysore are. Members of Scheduled Castes and Scheduled tribes constitute 15.1% of the population. According to the National Crime Records Bureau of India, the number of cognisable crime incidents reported in Mysore during 2010 was 3,407 (second in the state, after Bangalore's 32,188), increasing from 3,183 incidents reported in 2009. The residents of the city are known as Mysoreans in English and Mysoorinavaru in Kannada. The dispute between Karnataka and Tamil Nadu over the sharing of Kaveri river water often leads to minor altercations and demonstrations in the city. Growth in the information technology industry in Mysore has led to a change in the city's demographic profile; likely strains on the infrastructure and haphazard growth of the city resulting from the demographic change have been a cause of concern for some of its citizens. For the industrial development of the city, the Karnataka Industrial Areas Development Board (KIADB) has established four industrial areas in and around Mysore, in the Belagola, Belawadi, Hebbal and Hootagalli areas. One of the major industrial in the proximity of Mysore is Nanjangud which will be Satellite town to Mysore. Nanjangud industrial area hosts a number of Big industries like Reid and Taylor, Jubiliant, TVS, Asian Paints. Nanjangud Industrial area also boasts being 2nd highest VAT / Sales Tax payer which is about 400+ crores after Peenya which is in state capital Bangalore. Mysore also hosts many central government organisations like CFTRI, DFRL, CIPET, RPM ( Rare Material Project ), RBI Note printing Press and RBI Paper Printing Press. The growth of the information technology industry in the first decade of the 21st century has resulted in the city emerging as the second largest software exporter in Karnataka, next to Bangalore. The city contributed Rs. 1363 crore (US$275 million) to Karnataka's IT exports. Before the advent of the European system of education in Mysore, agraharas (Brahmin quarters) provided Vedic education to Hindus, and madrassas provided schooling for Muslims. :459 Modern education began in Mysore when a free English school was established in 1833. Maharaja College was founded in 1864. A high school exclusively for girls was established in 1881 and later converted into the Maharani's Women's College. The Industrial School, the first institute for technical education in the city, was established in 1892; this was followed by the Chamarajendra Technical Institute in 1913.:601 While the modern system of education was making inroads, colleges such as the Mysore Sanskrit college, established in 1876, continued to provide Vedic education. :595 Vivekananda Institute, Mysore is an international organisation giving training to Indians and foreigners in development management. The education system was enhanced by the establishment of the University of Mysore in 1916, making it the first outside the British administration in India. Other important institutes are CFTRI, MYRA School of Business (founded in 2011) and Mysore Medical College. Referred to as the cultural capital of South Karnataka, Mysore is well known for the festivities that take place during the period of Dasara, the state festival of Karnataka. The Dasara festivities, which are celebrated over a ten-day period, were first introduced by King Raja Wodeyar I in 1610. On the ninth day of Dasara, called Mahanavami, the royal sword is worshipped and is taken on a procession of decorated elephants, camels and horses. On the tenth day, called Vijayadashami, the traditional Dasara procession (locally known as Jumboo Savari) is held on the streets of Mysore which usually falls in the month of September or October.. the Idol of the Goddess Chamundeshwari is placed on a golden mantapa on the back of a decorated elephant and taken on a procession, accompanied by tabla, dance groups, music bands, decorated elephants, horses and camels. The procession starts from the Mysore Palace and culminates at a place called Bannimantapa, where the banni tree (Prosopis spicigera) is worshipped. The Dasara festivities culminate on the night of Vijayadashami with a torchlight parade, known locally as Panjina Kavayatthu. Mysore is called the City of Palaces because of several ornate examples in the city. Among the most notable are Amba Vilas, popularly known as Mysore Palace; Jaganmohana Palace, which also serves as an art gallery; Rajendra Vilas, also known as the summer palace; Lalitha Mahal, which has been converted into a hotel; and Jayalakshmi Vilas. :87–88 The main palace of Mysore was burned down in 1897, and the present-day structure was built on the same site. Amba Vilas palace exhibits an Indo-Saracenic style of architecture on the outside, but a distinctly Hoysala style in the interior. :82 Even though the Government of Karnataka maintains the Mysore palace, a small portion has been allocated for the erstwhile Royal family to live in. The Jayalakshmi Vilas Mansion was constructed by Sri Chamaraja Wodeyar for his daughter Jayalakshammanni. 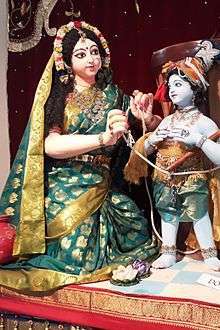 It is now a museum dedicated to folk culture and artefacts of the royal family. 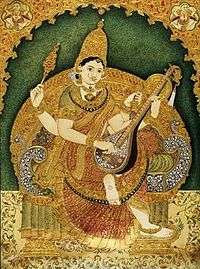 The Mysore painting style is an offshoot of the Vijayanagar school of painting, and King Raja Wodeyar (1578–1617 CE) is credited with having been its patron. :1 The distinctive feature of these paintings is the gesso work, to which gold foil is applied. :3 Mysore is known for rosewood inlay work; around 4,000 craftsmen were estimated to be involved in this art in 2002. The city lends its name to the Mysore silk saree, a women's garment made with pure silk and gold zari (thread). Mysore Peta, the traditional indigenous turban worn by the erstwhile rulers of Mysore, is worn by men in some traditional ceremonies. A notable local dessert that traces its history to the kitchen in the Mysore palace is Mysore pak. Mysore is the location of the International Ganjifa Research Centre, which researches the ancient card game Ganjifa and the art associated with it. The Chamarajendra Academy of Visual Arts (CAVA) offers education in visual art forms such as painting, graphics, sculpture, applied art, photography, photojournalism and art history. The Rangayana repertory company performs plays and offers certificate courses in subjects related to theatre. Kannada writers Kuvempu, Gopalakrishna Adiga and U. R. Ananthamurthy were educated in Mysore and served as professors at the Mysore University. R. K. Narayan, a popular English-language novelist and creator of the fictional town of Malgudi, and his cartoonist brother R. K. Laxman spent much of their life in Mysore. Mysore is connected by National Highway NH-212 to the state border town of Gundlupet, where the road forks into the states of Kerala and Tamil Nadu. :1 State Highway 17, which connects Mysore to Bangalore, was upgraded to a four-lane highway in 2006, reducing travel time between the two cities. A project was planned in 1994 to construct a new expressway to connect Bangalore and Mysore. After numerous legal hurdles, it remains unfinished as of 2012. State Highways 33 and 88 which connect Mysore to H D Kote and Madikeri respectively. The Karnataka State Road Transport Corporation (KSRTC) and other private agencies operate buses both within the city and between cities. 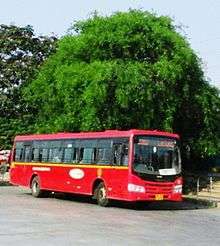 A new division of KSRTC called Mysore City Transport Corporation (MCTC) has been proposed. Within the city, buses are cheap and popular means of transport, auto-rickshaws are also available and tongas (horse-drawn carriages) are popular with tourists. Mysore also has a 42.5-kilometre (26.4 mi) long ring road that is being upgraded to six lanes by the MUDA. Mysore railway station has three lines, connecting it to Bangalore, Mangalore, Hassan and Chamarajanagar. The first railway line established in the city was the Bangalore–Mysore Junction metre gauge line, which was commissioned in 1882. All railway lines that serve the city are single track at some points and the rest of the stretch is double track, impeding faster connections to the city. All trains that connect to Mysore are operated by South Western Railway Zone, Hubli of Indian Railways. The fastest train to serve the city is the Shatabdi Express. Following three decades of dormancy, Mysore Airport was modernised in the mid-2000s, reopening to scheduled passenger service in October 2010. However, airlines have had difficulty maintaining service to the airport. As of December 2016, the airport is without commercial service. Newspaper publishing in Mysore started in 1859 when Bhashyam Bhashyacharya began publishing a weekly newspaper in Kannada called the Mysooru Vrittanta Bodhini, the first of a number of weekly newspapers published in the following three decades. A well-known Mysore publisher during Wodeyar rule was M. Venkatakrishnaiah, known as the father of Kannada journalism, who started several news magazines. Many local newspapers are published in Mysore and carry news mostly related to the city and its surroundings, and national and regional dailies in English and Kannada are available, as in the other parts of the state. Sudharma, the only Indian daily newspaper in Sanskrit, is published in Mysore. Mysore was the location of the first private radio broadcasting station in India when Akashavani (voice from the sky) was established in the city on 10 September 1935 by M.V. Gopalaswamy, a professor of psychology, at his house in the Vontikoppal area of Mysore, using a 50-watt transmitter. The station was taken over by the princely state of Mysore in 1941 and was moved to Bangalore in 1955. In 1957, Akashvani was chosen as the official name of All India Radio (AIR), the radio broadcaster of the Government of India. The AIR station at Mysore broadcasts an FM radio channel at 100.6 MHz, and Gyan Vani broadcasts on 105.2. BIG FM and Red FM are the two private FM channels operating in the city. Mysore started receiving television broadcasts in the early 1980s, when Doordarshan (public service broadcaster of the Indian government) started broadcasting its national channel all over India. This was the only channel available to Mysoreans until Star TV started satellite channels in 1991. Direct-to-home channels are now available in Mysore. The Wodeyar kings of Mysore were patrons of games and sports. King Krishnaraja Wodeyar III had a passion for indoor games. He invented new board games and popularised the ganjifa card game. Malla-yuddha (traditional wrestling) has a history in Mysore dating back to the 16th century. The wrestling competition held in Mysore during the Dasara celebrations attracts wrestlers from all over India. An annual sports meeting is organised there during the Dasara season too. In 1997 Mysore and Bangalore co-hosted the city's biggest sports event ever, the National Games of India. Mysore was the venue for six sports: archery, gymnastics, equestrianism, handball, table tennis and wrestling. Cricket is by far the most popular sport in Mysore. The city has five established cricket grounds. Javagal Srinath, who represented India for several years as its frontline fast bowler, comes from Mysore. Other prominent sportsmen from the city are Prahlad Srinath, who has represented India in Davis Cup tennis tournaments; Reeth Abraham, a national champion in the heptathlon and a long jump record holder; Sagar Kashyap, the youngest Indian to officiate at the Wimbledon Championships; and Rahul Ganapathy, a national amateur golf champion. The Mysore race course hosts a racing season each year from August through October. India's first youth hostel was formed in the Maharaja's College Hostel in 1949. Mysore is a major tourist destination in its own right and serves as a base for other tourist attractions in the vicinity. The city receives large number of tourists during the 10-day Dasara festival. One of the most visited monuments in India, the Amba Vilas Palace, or Mysore Palace, is the centre of the Dasara festivities. The Jaganmohana Palace, The Sand Sculpture Museum the Jayalakshmi Vilas and the Lalitha Mahal are other palaces in the city. Chamundeshwari Temple, atop the Chamundi Hills, and St. Philomena's Church, Wesley's Cathedral are notable religious places in Mysore. The Mysore Zoo, established in 1892, the Karanji and Kukkarahalli lakes are popular recreational destinations. Mysore has the Regional Museum of Natural History, the Folk Lore Museum, the Railway Museum and the Oriental Research Institute. The city is a centre for yoga-related health tourism that attracts domestic and foreign visitors, particularly those who, for years, came to study with the late ashtanga yoga guru K. Pattabhi Jois. A short distance from Mysore city is the neighbouring Mandya District's Krishnarajasagar Dam and the adjoining Brindavan Gardens, where a musical fountain show is held every evening. Places of historic importance close to Mysore are Mandya District's Ranganathaswamy Temple, Srirangapatna. And other historical places are Somanathapura and Talakad. B R Hills, Himavad Gopalaswamy Betta hill and the hill stations of Ooty, Sultan Bathery and Madikeri are close to Mysore. Popular destinations for wildlife enthusiasts near Mysore include the Nagarhole National Park, the wildlife sanctuaries at Melkote, Mandya and B R Hills and the bird sanctuaries at Ranganathittu, Mandya and Kokrebellur, Mandya. Bandipur National Park and Mudumalai National Park, which are sanctuaries for gaur, chital, elephants, tigers, Indian leopards and other threatened species, lie between 40 and 60 mi (64 and 97 km) to the south. Other tourist spots near Mysore include the religious locations of Nanjanagud and Bylakuppe and the waterfalls at neighboring districts of Mandya's Shivanasamudra. Mysore was twinned with Cincinnati in 2012. ↑ "Lingappa elected Mayor, Mahadevamma deputy". The Hindu. 10 October 2014. Retrieved 10 May 2015. 1 2 "Action plan for solid waste management" (PDF). Mysore City Corporation. Archived from the original (PDF) on 29 November 2007. Retrieved 25 September 2007. 1 2 3 "Table 2: PR cities 1 lakh and above" (XLS). Provisional Population Totals, Census of India 2011. Registrar General and Census Commissioner of India. Retrieved 3 March 2012. ↑ "Mysore or Mysuru, pak tastes the same". 4 November 2014. Retrieved 9 August 2015. 1 2 Vasudeva, Rashmi (3 November 2006). "Land of milk and honey". The Deccan Herald. Retrieved 12 November 2007. ↑ "They will be Belagavi, Mangalooru, Mysuru from November next". The Hindu. 19 December 2005. Retrieved 14 December 2007. 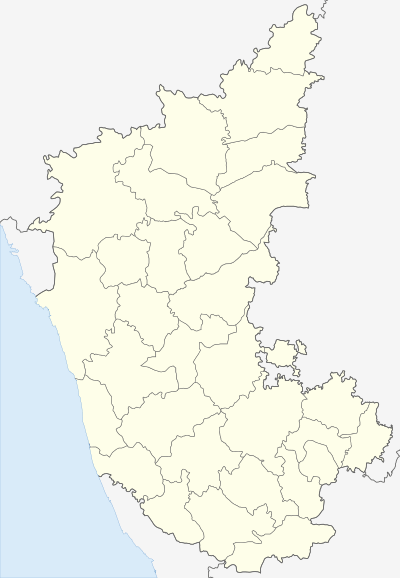 ↑ "Belgaum keeps 'Bengaluru' in limbo". The Hindu. 11 January 2011. Retrieved 4 March 2012. ↑ Renaming, Cities (18 October 2014). "Bangalore, Mysore, Other Karnataka Cities to be Renamed on 1 November" (ibtimes.co.in). ibtimes.co.in. ↑ Renaming, Cities (18 October 2014). "Centre nod for Karnataka's proposal on renaming cities". The Hindu. ↑ New City, Names to Karnatka. "New name for cities". The Hindu. Retrieved 1 November 2014. 1 2 3 4 Rice, B.L. (1876). Mysore and Coorg: Mysore, by districts. Mysore: Mysore Government Press. Retrieved 29 February 2012. 1 2 Rice, B.L. (2001) . Mysore gazetteer compiled for government–vol 1. New Delhi: Asian Educational Services. ISBN 81-206-0977-8. 1 2 3 4 5 Kamath, Suryanath U. (2001) . A concise history of Karnataka: from pre-historic times to the present. Bangalore: Jupiter books. LCCN 80905179. OCLC 7796041. ↑ "A museum to showcase Mysore's history". The Hindu. 7 July 2005. Retrieved 20 November 2007. ↑ "Tree ownership rights to growers may boost green cover". The Hindu. 26 August 2004. Retrieved 20 November 2007. ↑ "Procession taken out to mark Quit India movement". The Hindu. 10 August 2006. Retrieved 20 November 2007. ↑ Venkatkrishnan, Sriam (22 September 2006). "Maharajah of music". The Hindu. Retrieved 21 November 2007. 1 2 3 4 5 Sharma, Ravi (2005). "Tourism delights". Frontline. The Hindu. 22 (21). Retrieved 29 February 2012. ↑ Deepak, S.N. (1 August 2004). "A doyen of film production". The Deccan Herald. Retrieved 1 March 2012. ↑ Krishna, M.J. (8 October 2004). "Caring in captivity". The Hindu Business Line. Retrieved 1 March 2012. 1 2 Raman, Afried (1994). "Climate and clothing". Bangalore – Mysore. Hyderabad, India: Orient Longman. p. 110. ISBN 0-86311-431-8. Retrieved 25 September 2007. 1 2 3 4 "Mysore City Development Plan" (PDF). Jawaharlal Nehru National Urban Renewal Mission, Government of India. Archived from the original (PDF) on 27 September 2007. Retrieved 25 September 2007. ↑ Kumar, R. Krishna (10 April 2007). "Severe heat wave likely to hit Mysore in the next few weeks". The Hindu. Retrieved 25 September 2007. ↑ "Karnataka's coldest day in 100 years, 7 dead in Andhra Pradesh". IBN Live. 18 January 2012. Retrieved 4 March 2012. ↑ "Monthly mean maximum & minimum temperature and total rainfall based upon 1901–2000 data" (PDF). India Meteorological Department. p. 45. Retrieved 2012-03-03. ↑ "NGOs welcome formation of ward panels". The Hindu. 28 June 2007. Retrieved 26 September 2007. ↑ "Rs. 3-crore surplus budget for MCC". The Hindu. 30 March 2011. Retrieved 3 March 2012. ↑ "Mysore City Corporation gets award for better civic amenities". The Hindu. 10 July 2011. Retrieved 4 March 2012. ↑ "Outer Ring Road may ease traffic woes in Mysore". The Hindu. 14 February 2004. Retrieved 26 September 2007. ↑ "Forum says land mafia is thriving in Mysore". The Hindu. 2 May 2006. Retrieved 26 September 2007. ↑ "Council passes amendment bill". The Hindu. 29 January 2005. Retrieved 13 December 2007. ↑ "Second stage of Melapura water project inaugurated". The Hindu. 7 May 2007. Retrieved 25 September 2007. ↑ Kumar, R. Krishna (12 June 2007). "Is Mysore city heading for a water crisis?". The Hindu. Retrieved 25 September 2007. ↑ Athrady, Ajith (10 May 2010). "Mysore comes clean over B'lore". Deccan Herald. Retrieved 12 May 2010. 1 2 "Triangular contest likely in four Assembly seats". The Hindu. 4 March 2004. Retrieved 26 September 2007. ↑ "Religion". Census GIS India. Registrar General & Census Commissioner, India. Archived from the original on 6 July 2010. Retrieved 27 November 2007. ↑ "Data on rural & urban areas: figures at a glance Karnataka" (PDF). Census of India 2011, Provisional Population Totals. Registrar General & Census Commissioner, India. Retrieved 3 March 2012. ↑ Kahuri, Searh Kabui (2010). Engendered land administration system—Mysore slums upgrading (PDF) (PDF). Enschede, Netherlands: International Institute for Geo-information Science and Earth Observation. p. 3. Retrieved 28 March 2012. 1 2 "Population of Karnataka". Census GIS India. Registrar General & Census Commissioner, India. Retrieved 3 March 2012. ↑ "City-wise Incidence of Cognizable Crime (IPC) During 2010" (PDF). 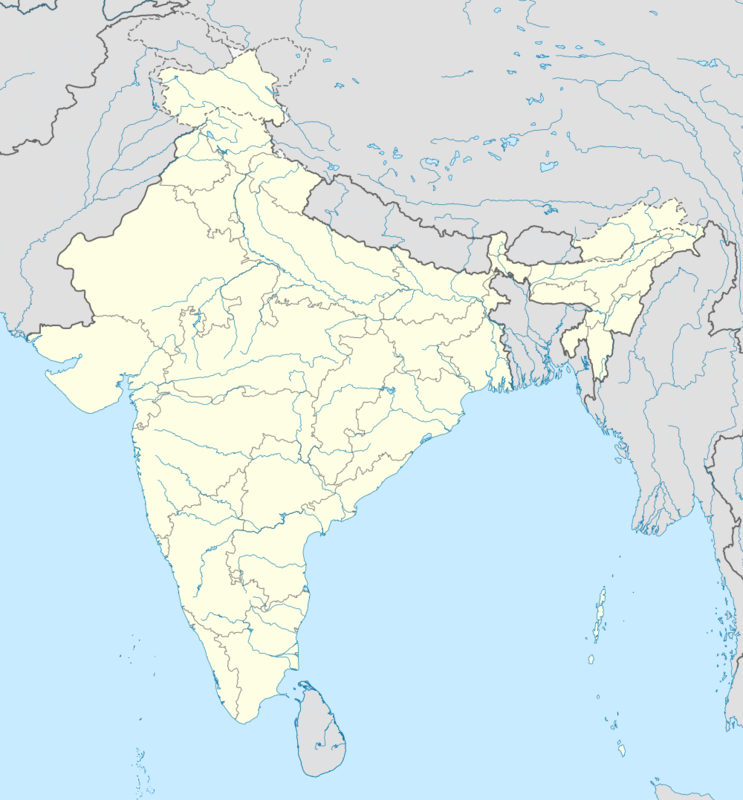 Crime in India 2010. National Crime Records Bureau of India. p. 301. Retrieved 3 March 2012. ↑ "City-wise Incidence of Cognizable Crime (IPC) during 2009" (PDF). Crime in India 2009. National Crime Records Bureau of India. p. 301. Retrieved 3 March 2012. ↑ "Cauvery verdict: bandh total, peaceful in Mysore city". The Hindu. 13 February 2007. Retrieved 25 September 2007. ↑ Khan, Liaqh A. (2 January 2006). "Concern expressed over impact of anticipated IT boom on Mysore". The Hindu. Retrieved 25 September 2007. ↑ Kumar, R. Krishna (6 January 2011). 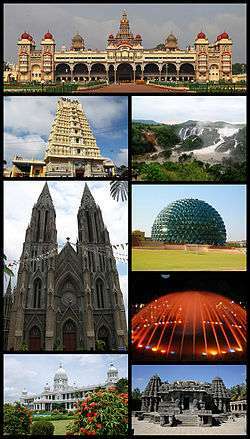 "Over 3 million tourists visit Mysore in 2010". The Hindu. Retrieved 12 April 2012. 1 2 Sharma, Ravi (2004). "A city in transition". Frontline. The Hindu. 21 (3). Retrieved 29 February 2012. ↑ "Mokshagundam Visvesvaraya". Department of Science and Technology, Government of India. Retrieved 1 October 2007. 1 2 3 4 Rao, C. Hayavadana (1927). Mysore Gazetteer. Bangalore: Government Press, Mysore state. ↑ "KIADB industrial areas". The Karnataka Industrial Development Board. Archived from the original on 2 October 2007. Retrieved 1 October 2007. ↑ Khan, Liaqh A. (6 June 2008). "Software exports hover around Rs. 1,100 cr.". The Hindu. Retrieved 19 February 2012. ↑ "Education and literacy" (PDF). Human development in Karnataka 1999. Planning Department, Government of Karnataka. p. 50. Archived (PDF) from the original on 24 July 2011. Retrieved 30 September 2007. ↑ "Welcome to our college website". Maharani's Arts and Commerce College for Women, Mysore. Retrieved 29 February 2012. 1 2 3 4 5 Sharma, Ravi. "Mysore Dasara: A historic festival". Frontline. The Hindu. 22 (21). Retrieved 4 April 2007. 1 2 Raman, Afried (1994). Bangalore – Mysore. Hyderabad, India: Orient Longman. ISBN 0-86311-431-8. Retrieved 25 September 2007. ↑ Haldipur, Priyanka (19 April 2005). "Of monumental value". Deccan Herald. Retrieved 3 March 2012. 1 2 "Mysore Painting" (PDF). Indianfolklore.org. National Folklore Support Centre. Archived from the original (PDF) on 30 October 2003. Retrieved 5 April 2007. ↑ Chari, Pushpa (30 May 2002). "Intricate Patterns". The Hindu. Retrieved 4 October 2007. ↑ "Mysore – silk weaving & printing silk products". Karnataka Silk Industries Corporation. Retrieved 9 April 2007. ↑ De, Aditi (8 June 2003). "A right royal hand". The Hindu. Retrieved 4 October 2007. ↑ Deshpande, V A (3 May 2006). "CAVA—much sought after for visual arts students". Deccan Herald. Retrieved 4 October 2007. ↑ Kaiappa B B, Anjali; N S, Islahuddin (19 July 2005). "Right on the cue". Deccan Herald. Retrieved 12 August 2007. ↑ Guha, Ramachandra (25 April 2004). "The Mysore generation". The Hindu. Retrieved 4 October 2007. ↑ Sayeed, Vikhar Ahmed (2005). "House with a view". Frontline. The Hindu. 28 (20). Retrieved 29 February 2012. ↑ "National Highways in Karnataka" (PDF). The National Informatics Centre. Retrieved 26 September 2007. ↑ "Bangalore-Mysore journey to be faster". The Hindu. 30 August 2006. Retrieved 26 September 2007. ↑ Rajendran, S (29 July 2007). "International consortium ready to take up Bangalore-Mysore Expressway project". The Hindu. Retrieved 26 September 2007. ↑ "New expressway may link Mysore and Bangalore". Times of India. 11 March 2012. Retrieved 11 March 2012. ↑ "Roads in Karnataka". Karnataka Public Works, Ports and Inland Water Transport Department. Retrieved 9 April 2008. ↑ Srivatsa, Sharath S. (1 October 2005). "Riding through time". The Hindu. Retrieved 5 March 2012. ↑ "Mysore District Information Projects Approved". Mysore: Mysore District Collectorate. Retrieved 3 February 2012. ↑ "Mysore Rail Museum celebrates silver jubilee". The Hindu. 3 June 2004. Retrieved 26 September 2007. 1 2 Gayathri, J. V. "Vernacular newspapers and periodicals: their influence on modernity, reforms and trends in nineteenth-century Mysore". 17th European conference on modern South Asian studies, Heidelberg. University of Heidelberg. Retrieved 27 September 2007. ↑ Havanur, Shrinivas (27 July 2004). "His struggle for justice". Deccan Herald. Retrieved 5 March 2012. ↑ "Circulation as claimed by publisher for 2005–06". The Registrar of Newspapers for India. Retrieved 27 September 2007. ↑ Khajane, Muralidhara (21 July 2007). "Keeping Sanskrit alive". The Hindu. Retrieved 28 November 2007. ↑ Ganesh, Deepa (9 March 2006). "Still a hot favourite at 50". The Hindu. Retrieved 27 September 2007. ↑ Kumar, Mala (8 July 2007). "Passion for transmission". Deccan Herald. Retrieved 5 September 2012. ↑ "South Zone Region Services" (PDF). All India Radio. Retrieved 27 September 2007. ↑ "Electronic Media Production Centre (EMPC), facilities". Indira Gandhi National Open University. Retrieved 4 March 2012. ↑ "List of operational pvt. FM radio stations in India" (PDF). Ministry of Information and Broadcasting, Government of India. Retrieved 4 March 2012. ↑ "Direct-to-Home service launched". The Hindu. 21 September 2004. Retrieved 27 September 2007. ↑ Quattlebaum, Mary (25 March 2005). "Fun is the name of the game". The Washington Post. Retrieved 27 September 2007. ↑ "Nada kusti as popular as ever". The Hindu. 30 September 2003. Retrieved 27 September 2007. ↑ "Mysore Dasara Sports from today". The Hindu. 7 October 2005. Retrieved 27 September 2007. ↑ S Mageshwaran (1 June 1997). "Delayed start for gymnastics". The Indian Express. Retrieved 27 September 2007. ↑ "Business slows down as cricket fever rises". Times of India. 27 February 2011. Retrieved 6 April 2012. ↑ "Cricket brings Mysore to a grinding halt". The Hindu. 14 March 2004. Retrieved 27 September 2007. ↑ "Grounds – India – Mysore". cricinfo.com. Retrieved 28 October 2016. ↑ Guha, Ramachandra (3 February 2002). "A cricketer and a gentleman". The Hindu. Retrieved 27 September 2007. ↑ S K John (7 April 1998). "Back-up cast needs a boost". The Indian Express. Retrieved 27 September 2007. ↑ Ashok, Kalyan (6 March 2003). "A reverie with Reeth". The Hindu. Retrieved 1 March 2012. ↑ Rao, Rakesh (28 October 2005). "Rohana soars after stunning eagle". The Hindu. Retrieved 27 September 2007. ↑ "Kashyap to officiate up to Wimbledon quarters – Times of India". Articles.timesofindia.indiatimes.com. 7 May 2011. Retrieved 14 April 2012. ↑ "Mysore season from August 23". The Hindu. 22 August 2007. Retrieved 28 September 2007. ↑ "Mysore Youth Hostel". The Ministry of Youth Affairs and Sports, Government of India. Archived from the original on 17 October 2007. Retrieved 28 September 2007. ↑ Kumar, R. Krishna (25 September 2005). "'Mysore Tourism Passport' to provide free entry to six places". The Hindu. Retrieved 5 November 2001. ↑ Kumar, R. Krishna (17 August 2007). "Mysore Palace beats Taj Mahal in popularity". The Hindu. Retrieved 5 November 2001. ↑ Srivathsan, A. (23 February 2007). "City of mythical beginnings". The Hindu. Retrieved 5 November 2001. ↑ "A day after Dasara in Mysore ..". Deccan Herald. 23 October 2007. Archived from the original on 25 October 2007. Retrieved 5 November 2007. ↑ "Yoga draws people from all over to Mysore". The Hindu. 5 February 2007. Retrieved 5 November 2007. ↑ Kumar, R. Krishna (10 March 2005). "Three lakes of Mysore on IBAN list". The Hindu. Retrieved 5 November 2007. ↑ "Cincinnati adds new sister city". WLWT (11 July 2012) Retrieved on 2016-10-28. ↑ "Green signal for Mysore-Cincinnati pact". Times of India (4 August 2012). Retrieved on 2012-11-26. Raman, Afried (1994). Bangalore – Mysore. Hyderabad, India: Orient Longman. ISBN 0-86311-431-8. Retrieved 25 September 2007. Rice, B.L. (1876). Mysore and Coorg: Mysore, by districts. Mysore: Mysore Government Press. Retrieved 29 February 2012.